My family loves to cook when we can spend time together, and after we cook we thoroughly enjoy the fruits of our labor. Often as we sit down to share a meal together, we are busy planning our next cooking adventure. Since the kids in our family enjoy sharing kitchen chores, we often allow them to complete easy recipes on their own (with supervision) to develop their cooking skills as well as explore foods that they normally wouldn’t choose. My thirteen-year-old granddaughter recently took a week-long teen cooking class at Sur Le Table, and now is even more excited about helping out in the kitchen. 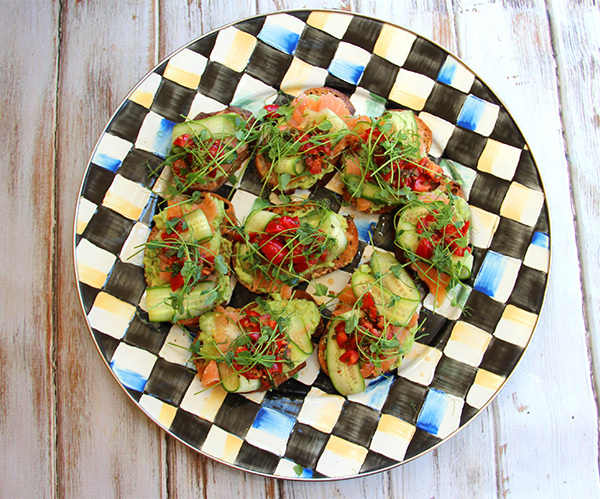 This past week, while our family gathered at my daughter’s home in Michigan, we chose a couple of easy recipes the kids could tackle on their own, including this open sandwich topped with creamy avocado mash, crisp cucumber slices, smoked salmon, and a spicy tomato salsa. My granddaughter loves smoked salmon, so she chose this recipe as her contribution. 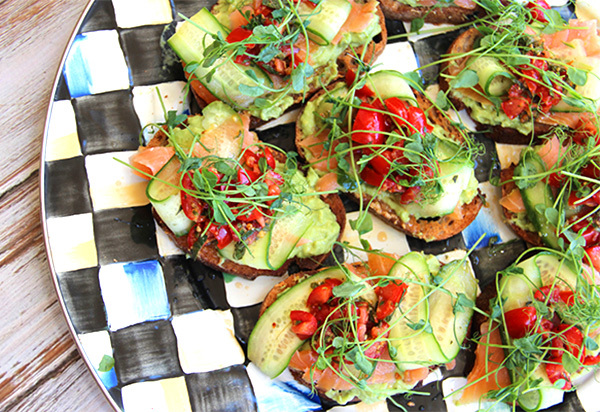 These rye toasts were light, fresh tasting, and had enough flavor to please everyone. We enjoyed these toasts for lunch this week along with a crisp mixed salad and fresh fruit for dessert, but they would also be perfect for a light summer appetizer or party food if cut small, or if you use a long, thin loaf of rye bread. All the ingredients can be prepared ahead of time so you can quickly assemble the sandwiches when needed. Toast the rye bread slices until lightly browned on each side. In a small bowl, mash together the avocado, yogurt, lemon juice, salt and pepper. In another bowl, stir together the tomato salsa ingredients. Spread enough avocado mash over each toast to cover the top. Tear the smoked salmon into pieces and arrange on the avocado. Fold two cucumber ribbons onto each toast, then spoon a little of the tomato salsa on top. 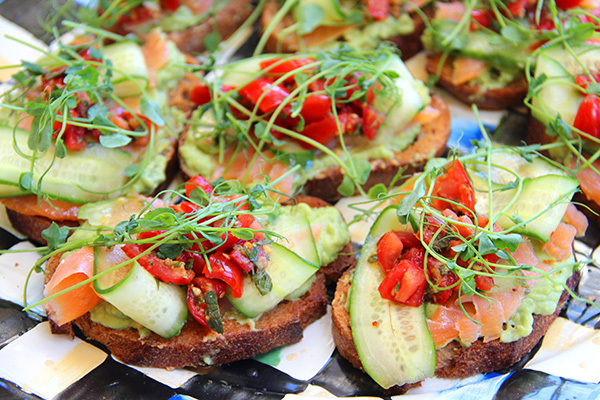 Arrange the toasts on a platter, then arrange the pea shoots or cress on top. Sprinkle with cracked black pepper and then serve.